Mar. 27, 2018 - These rescued orphan kangaroos were found fighting in a sanctuary in New South Wales. Their names are Kanku and Jake. They were rescued and brought to this animal sanctuary when they were young. Eventually they were released back into the wild. They still return to the sanctuary for daily visits—and sometimes to have a quick tussle. 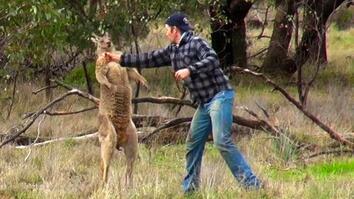 Many kangaroos will fight for territory or mating privileges, but it is likely that these two were just sparring. 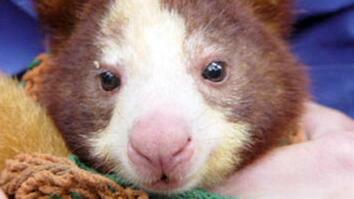 These rescued orphan kangaroos were found fighting in a sanctuary in New South Wales. Their names are Kanku and Jake. They were rescued and brought to this animal sanctuary when they were young. Eventually they were released back into the wild. They still return to the sanctuary for daily visits—and sometimes to have a quick tussle. 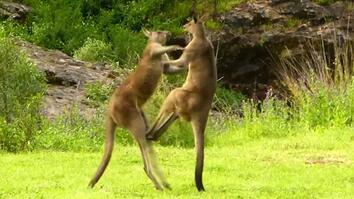 Many kangaroos will fight for territory or mating privileges, but it is likely that these two were just sparring.